Enter shipping destination postcode: (i)	Don't know the postcode? Use the Australian Post lookup - http://auspost.com.au/postcode. Just in! 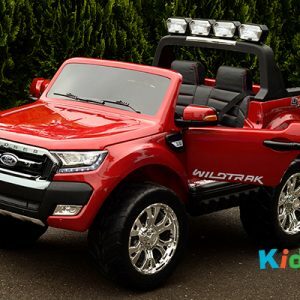 The 24v Licensed Ford Ranger, 2018 edition is here! This amazing ride on car not only has double the voltage, to give you more drive time, it also has 4 driving motors! 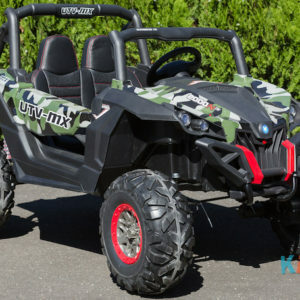 Plus it comes with MP3 functionality, USB/SD card socket, slow start, working suspension, a two-point seatbelt, leather seats & EVA wheels! Our 2018 Ford Rangers are already shaping up to be the HOTTEST car of the year. Make sure you get yours today before it’s too late. 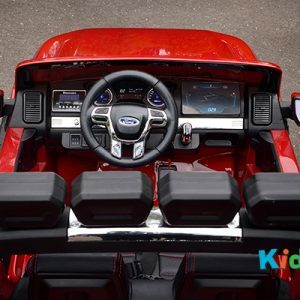 The electric ride on Ford Rangers are something Kidz Auto are incredible proud to offer! 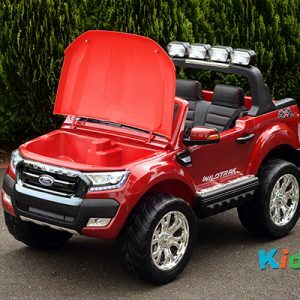 As an official Ford licensed product, you can be sure that this ride on toy is a mean match for any other kids electric car on the street! 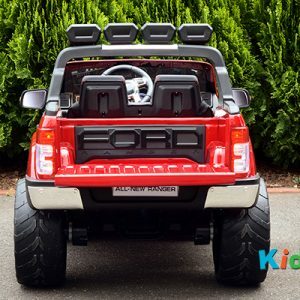 This fantastic electric toy car is perfect for off road adventures and lets your kids explore the great Australian outdoors in a safe and comfortable, yet fun way! Nothing is more fun than going on awesome ventures into the wild and learning all about the world around you. 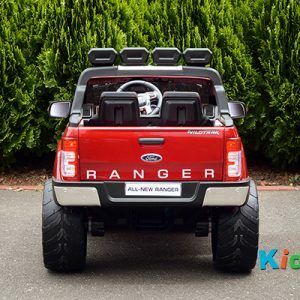 Give your child the gift of adventure with a ride-on electric Ford Ranger! This 2018 Licensed Ford Ranger (24v) is identical to the advertised product, just a different colour. Got a question about our ride-on cars? We’ve answered the most commonly asked questions. If you have any other questions, please feel free to get in touch. Where are your cars made? We source cars from around the world to ensure that you get the best quality at the best price. It also depends on the make and model. How long will my car stay charged for? A fully charged battery should last between 45 minutes to 1 hour 15 minutes depending on the surface the car is riding on, the weight the child and the frequency of it being driven. The flatter and smoother the surface, the longer the battery will last. After 100 recharges you will start to notice that you won’t be getting the same run time between charges, please get in contact with us for spare parts and we can quote you on the replacement and delivery of a new battery. Please ensure that you DO NOT charge the battery for any longer than 8 hours. If the battery is charged for longer it will unfortunately cause permanent damage and you will need to replace it. You need to also ensure that you charge the battery at least once a month when not in use. 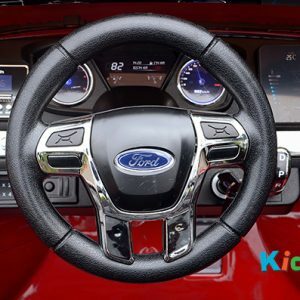 Are cars controlled by remote or can my child control it themselves? 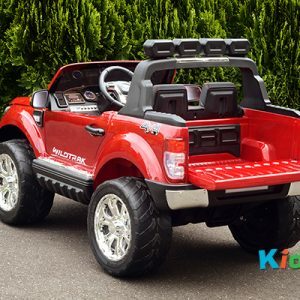 All our cars can be operated by your young one. And depending on the vehicle will depend on if it has a parental remote control. 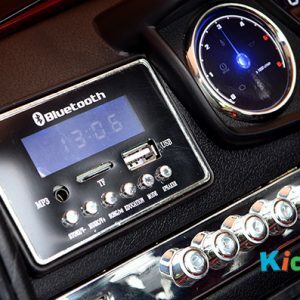 To know which cars can also be controlled by remote control we have a “Remote Control” icon in the features section as well as the “What’s included” section. To switch from self/driver control to the remote is easy – it’s just a flick of a switch. What is your delivery time/estimated shipping time? 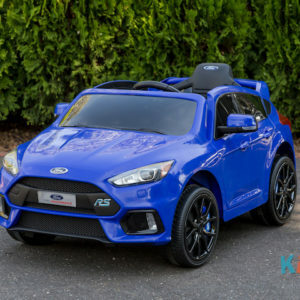 Once your order and payment has been completed you should expect to receive your awesome new ride-on car within 5-7 business days for Melbourne, Sydney and Brisbane metropolitan areas, and 7-9 business days for other areas. Delivery costs vary by destination and we work with a number of different delivery companies to get the best price for you. To get an estimate of how much shipping will be you can click “Calculate Shipping” and enter your postcode on the page of any ride-on car you are looking buy. Yes, we do offer express post. When selecting your prefered shipping method select “TNT Overnight Express”. Will I be notified of the delivery day? Currently no, this is a feature we are building though. We normally ship your item very quickly after being received and paid. For sure you can. Just select the “Pickup” option when you checkout and then in the “Order Notes” section let us know the details. Car dimensions and weight is on each page to give you a good idea of shipping costs. I am ordering from overseas, how do I enter the correct shipping details? Just simply enter the Australian delivery address at check-out and place any details in the “Order Notes” that you would like us to know. Ordering from overseas & your shipping costs aren’t being calculated? If after you have filled in your overseas billing address and Australian shipping address but the shipping costs still isn’t being calculate, please enter the billing address as the Australian address as well. Don’t worry, we will still send you all the required details & invoices to your email address. Still having an issue calculating shipping? Still having an issue? We’re sorry! We have had a very few people say they are still facing this issue. Our team is trying to see what the potential issue could be. If you are still facing an issue please get in touch with us (info@kidzauto.com.au) and we will be able to manually process your order. I selected shipping and now want to pick up. Can I change it? It depends on how quick you are! If the order has already been shipped then unfortunately it’s not possible to change it. If we can track down your order before it’s dispatched, we’ll be happy to have you come by to pick it up from us. Do you ship to other countries besides Australia? Yes, we also have ride on cars in New Zealand. 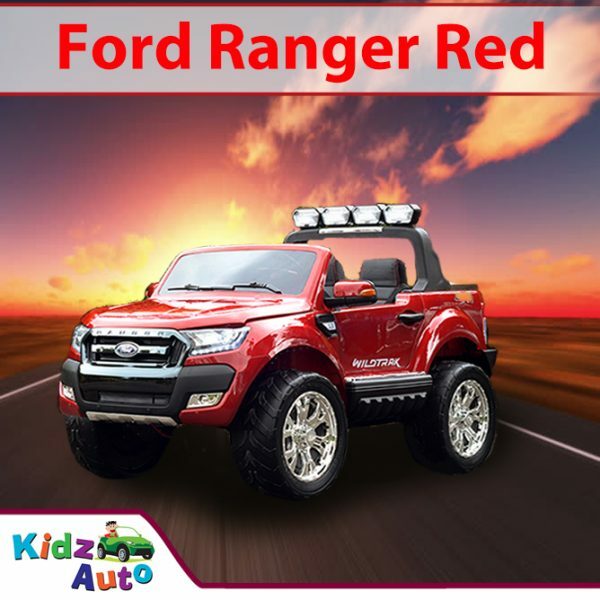 Just visit kidzauto.co.nz to see our complete range. Note: Our ride on cars have a lithium battery so they are not allowed to be transported by air freight. If you did want to purchase this for someone overseas and need to ship it to them via airfreight you won’t be able to. Sorry! How are the cars shipped? All cars are couriered by road and we use a range of trusted delivery companies including; Toll, Allied, TNT, StarTrack, Fastway and Australia Post. Our selection is based on the best price at the time of order. If you have a delivery preference, please let us know. What are your payment options are available? We accept all major credit cards, PayPal, Afterpay, Zippay, or direct deposit into our CBA account. A cash payment can also be made in case you’ve opted to pick-up your new ride-on car. We also offer you the option to pay by layby. We have introduced layby to make it easier to get your car. When purchasing your ride-on car just select “Layby Order” and when we receive your order we will send across your payment schedule. Please remember to add the date you would like to have it delivered to the “Order Notes” section. Yes, we offer both AfterPay & Zippay. Just select the car that you want and then on the checkout page select AfterPay or Zippay as your payment method. This will connect you to your AfterPay or Zippay account to complete the purchase. Can I order online and then pickup to save shipping costs? Yes, if you are based in Victoria you can pick up from our Melbourne showroom, or if you are based in Queensland from our Brisbane distribution centre. When on the checkout page just select the “Pick-Up” option under shipping. Our shop is located in Lysterfield, Melbourne, Victoria (3156). If you want to pop by for a visit to see the range of cars to see them in action you’re always more than welcome. We also have a distribution centre in Brisbane where you can buy online and pickup in Brisbane to save on the shipping costs. If I purchase my car can someone else pick it up? Yes, when purchasing the car just let us know who will be picking it up in “Order Notes” section on the checkout page. If you would like to change who picks up the car after you have already made a purchase, just send us a quick email. I selected pickup and now want to arrange shipping. Can I change it? Yes, this isn’t a problem. Just send us a quick note with the address you would like it shipped to. We will let you know the exact shipping cost and once paid we will ship your order out! What days and times is your shop open? We are open Monday to Saturday from 9am until 4pm. It’s always a little busy so it’s best if you get in touch with us before to make the trip out to be sure someone can be at your service. Do you have offices outside of Melbourne? We have our shop & physical location in Melbourne, and a distribution centre in Brisbane where you can buy online and pickup, and we ship to all of Australia. 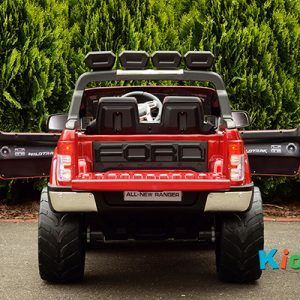 If you want to see our cars in action, we upload videos to our Kidz Auto YouTube channel to give you a better idea of our car range, how large they are on all their features. Do you have stock ready and waiting to go? If I like a car can I purchase straight away? Yes, we have all ride-on cars in stock. If you like what you see you can pay on the spot with cash, debit or credit card. Alternatively, we can send you our PayPal details and you can pay online. Where can I view your cars if I’m not in Melbourne? Our physical location is in Melbourne and at the moment we don’t have other physical locations in Australia. If you want to see our cars in action, we upload videos to our YouTube channel to give you a better idea of our car range, how large they are on all their features. What warranty comes with the car? We offer a 6 month manufacturer warranty. 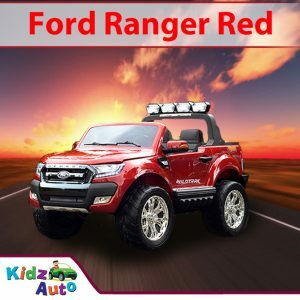 In case your car isn’t performing as expected please send us an email info@kidzauto.com.au with a brief description of the problem and a contact number. We will get in contact with you to help diagnose the problem over the phone, and if we still can’t get you up and running, we will send out spare parts or a replacement car to make sure your young one isn’t off the road for to long. We also offer a 100% guarantee that if you’re in any way not happy with the goods you have ordered, we will exchange them or give you a full refund within 7 days of receipt of the goods. To be eligible for a return, your item must be sent back to us (Lysterfield, VIC) unused and in the same condition that you received it. It must also be in the original packaging (unopened). Once we receive you return we will give it a quick once over and if everything is ok your refund will be processed (this normally 10 working days). Can we get warranty and guarantee of service? What happens if I have a problem with my new ride-on car? 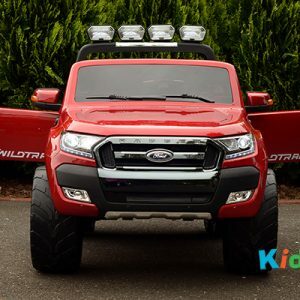 In case your ride-on car isn’t performing as expected please send us a quick email info@kidzauto.com.au with a brief description of the problem and a contact number. We will get in contact to try and get you up and running as quickly as we can. In case we can’t get you up and running over the phone we will send out spare parts or a replacement ride-on car to make sure your young one isn’t off the road for too long. Do you repair ride-on cars? 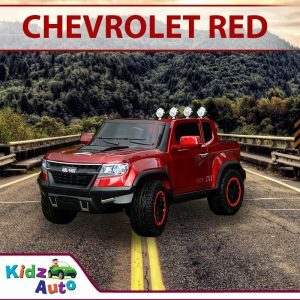 If you are having trouble getting your car going, not to worry, we can tune up your old ride-on cars with Kidz Auto Servicing. Our price for an initial investigation is $30, and we won’t go ahead with repairs until we give you a quotation on required parts and labor. 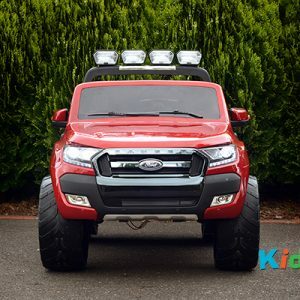 You can get more details here – https://www.kidzauto.com.au/repair-shop/. What is assembly? What does it include? Assembling our ride-on cars is easy and anyone can do it. 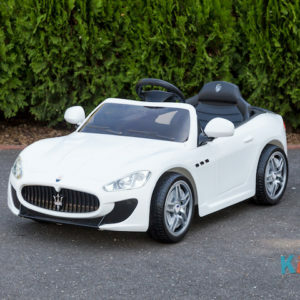 If you would prefer to save time you can let us take your car out of the box and assemble your awesome ride-on for you. Just select “Assembly” when you checkout, and your awesome new ride-on will arrive completely assembled and ready to go. Free Pickup from Melbourne, Brisbane, Perth & Sydney! Pick up your awesome ride on car for free from Melbourne, Brisbane, Perth and Sydney. When selecting your awesome ride on car, enter a Melbourne, Brisbane, Perth or Sydney zip code and then select free pickup! You can view and buy our cars at our Melbourne showroom. Brisbane, Perth and Sydney are distribution centres and you can only pick up after purchasing online.